In this sensible, simple-to-follow workbook, based on the acclaimedNo More Sleepless Nights program, one of the world's leadinginsomnia experts gives you the tools to be your own sleeptherapist. Filled with interactive quizzes, sleep logs, andself-evaluation exercises, which may be used in conjunction withthe patented Sleep Timer, the workbook will help you uncover theunderlying cause of your own sleep problem, and then put together apersonalized action plan for getting a good night's rest. 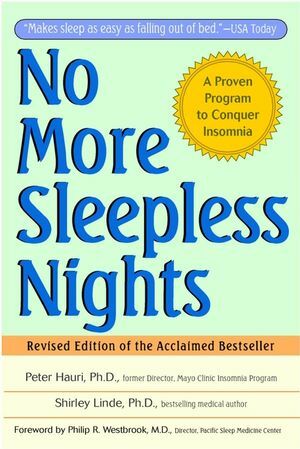 With advice on improving sleep hygiene and diet, the rightexercise, relaxation techniques, and more, No More SleeplessNights Workbook helps you conquer your own poor sleep rightnow. More importantly, it equips you to beat it again if it everreturns to disturb your dreams. PETER HAURI, Ph.D., is the former Director of the MayoClinic Insomnia Program and Codirector of the Sleep DisordersCenter at the Mayo Clinic. Dr. Hauri is considered by many as theworld's leading authority on insomnia. A pioneer in sleep research,he is the founder of the American Sleep Disorders Association. Helives in Rochester, Minnesota. SHIRLEY LINDE, Ph.D., is a bestselling author andcoauthor of thirty books, including Dr. Atkins' Superenergy Diet.She is also a recipient of the Outstanding Service Award from theAmerican Medical Writers Association. She lives in St. Petersburg,Florida. Many Suffer, Few Are Treated. Three Things Every Insomniac Should Do. The Room You Sleep In. Getting into the Right Frame of Mind. Learn to Manage Your Stress All Day. Make Your Diet Work for Your Sleep. Make Exercise Work for Your Sleep. Night Work, Jet Lag, and Seasonal Affective Disorder (SAD). How to Kick the Sleeping Pill Habit. When You Need Further Help.